The BRITAX B-READY Stroller offers safe, innovative features paired with a versatile, modular design that parents will appreciate. It features 14 different configurations--from forward-facing to rear-facing as well as in-line, double-stroller options for infant car seats, bassinets, and toddler seats. The B-READY is user-friendly with features including a large, removable storage basket and an adjustable handle with comfort grips. This stroller is appropriate for children from six months old up to 55 pounds when used with the top seat, or for infants from birth when used with the CHAPERONE Infant Car Seat (sold separately) or other major manufacturer's infant car seats. 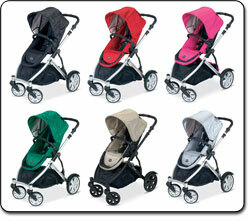 Features an adjustable five-point harness and a four-point suspension for optimum child security and comfort. Available in (left to right) Black, Red, Pink, Green, Twilight, and Silver. A three-position recline allows for easy seating, while a large canopy helps protect your child from sun and rain. Starting with the infant phase all the way to accommodating a younger sibling, the BRITAX B-READY Stroller is able to adapt to the changing needs of a growing family. You can start to safely transport a newborn in the stroller using the BRITAXCHAPERONE Infant Car Seat (sold separately) with the CLICK & GO integrated infant car seat adapter (included). And, it is compatible with other major infant car seat brands when used with the BRITAX Infant Car Seat Adapter Kit (sold separately). The top seat is reversible, with three reclining positions, so that children can start in the rear-facing position and then switch to forward-facing as they grow older. Best of all, the B-READY is designed to convert to an in-line, double stroller so it can accommodate another child with ease. Whether you need to transport dual infant car seats for twins or a bassinet and second seat for a newborn and older sibling, the stroller can be converted into 14 different configurations with the use of optional accessories, such as the B-READY Second Seat (sold separately). Ideal for parents and caretakers seeking a safe, comfortable stroller, the B-READY features a five-point harness; a quilted, suede-like, adjustable head pad; and four-point suspension. Busy parents and caregivers will appreciate that the padded, reflective harness can be adjusted without the need to re-thread, while the four-point suspension provides a smooth, comfortable ride. For additional versatility, the three-position recline and adjustable calf rest allow you to tilt back the stroller's seat when your baby falls asleep during a long walk. A large canopy with a sun visor blocks harmful UV rays from reaching your child's sensitive skin and a ventilation window offers circulation so your child will ride in comfort. 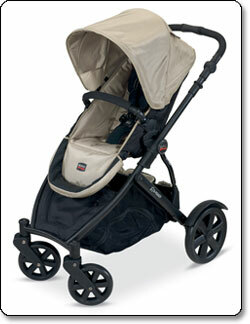 In addition, the stroller includes a rain cover that fits neatly in the under-seat storage for those unexpected showers. It's easy to fold the B-READY, thanks to its unique, simple fold design and automatic chassis lock. 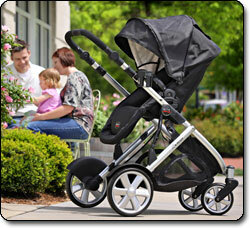 You can even fold the stroller with two seats left intact--a thoughtful, time-saving feature. A one-foot, one-motion brake with an indicator locks and unlocks both rear wheels with a simple press of a single foot pedal. The ergonomically-designed handle allows you to quickly adjust the handle height, while the comfort grips and one-hand steering allow for easy maneuverability for extended periods of time. The large, under-seat storage basket is ideal for holding diaper bags, purses, and grocery items, and can be accessed from all four sides. A removable storage bag with insulated drink holders is also included. The B-READY features an adult cup holder, essential for holding your water bottle. The B-READY is made from durable materials and is easy to wipe clean with a damp cloth. It's available in a selection of bold, solid colors, including Black, Green, Pink,Red, Silver, and Twilight to fit your taste and preference. The BRITAX B-READY Stroller is backed by a limited two-year warranty. One BRITAX B-READY Stroller chassis and child seat, CLICK & GO infant car seat adapters, adult cup holder, rain cover, and instruction guide.